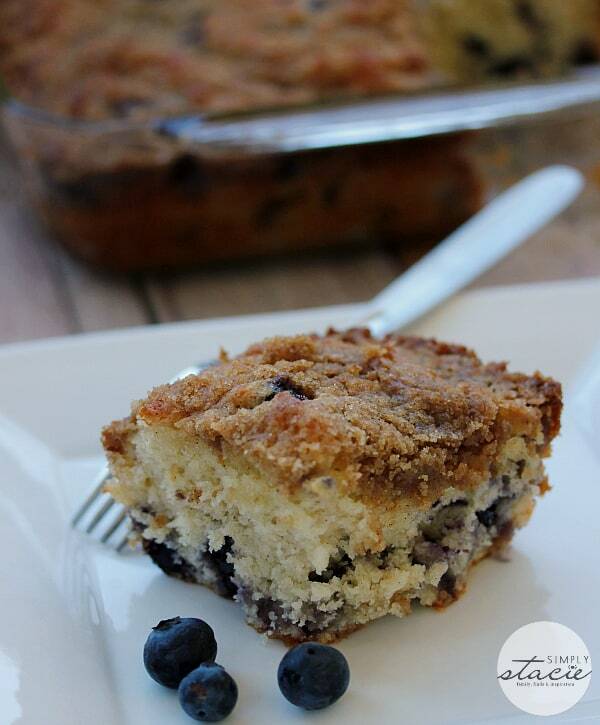 Blueberry Buckle Cake is going to be an instant family favorite. 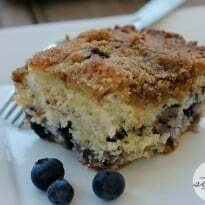 A moist cake that has fresh blueberries sprinkled throughout with a streusel topping. The perfect treat to serve up for breakfast, brunch, or even an afternoon snack. 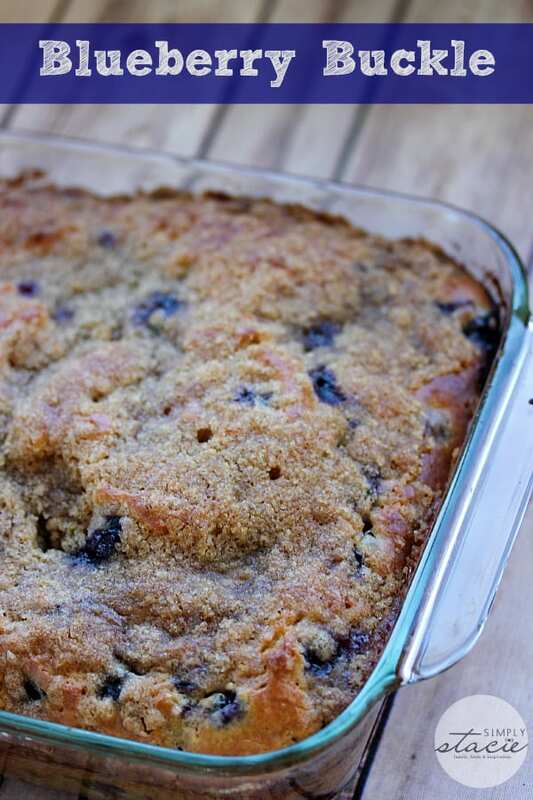 I have been making this Blueberry Buckle recipe for years, and let me say it is always an absolute delight to dish up. This is such a simple recipe that is great to make and serve for last minute guests, holiday gatherings, or a treat for you and your family. Truly, there is no wrong time to serve up this Blueberry Buckle Cake. You all know by now I love a good dessert! I love desserts that give you that comforting feel and can satisfy a sweet tooth in a hurry. This cake is not overly sweet, which is nice. The fresh blueberries in each bite are indeed an added treat. You won’t be disappointed if you give this recipe a go. Well, traditionally a buckle cake offers a cake-like batter that is filled with fresh fruit and topped with a streusel. As the cake bakes, you will see the fruit and cake transform to offer a buckle effect. The cake ‘buckles” around the fruit. Hence the name. Fresh Is Best | I reach for fresh blueberries when I serve up this cake because it does genuinely offer the best taste and texture. Dust Blueberries in Flour | Adding a teaspoon of flour to your fresh blueberries will help them from sinking to the bottom of the cake. Just mix four around and dust off any excess before dumping into the batter. Frozen Blueberries | In a pinch you can easily use frozen blueberries. You might need to adjust the cooking time for frozen, and then also note that the more you stir, the more blue color will leak over the cake. As you can see this Blueberry Buckle Cake is rather easy to make. With a little prep, you will have one outstanding cake that anyone could love. You bet! I have tried all types of fruit, and let me say the combination is always a winner. Fresh strawberries, rhubarb, blackberries, raspberries, and more. The possibilities are endless. I have even made a mixed berry buckle cake that was full of fresh and vibrant flavors. A cobbler is a baked dessert that offers a fruit topping with either a biscuit-like batter spread over the top. You will find all the fruit is at the bottom and then the cake-like topping baked on top. The buckle cake is a fruit filled cake that has a streusel topping. So when the fruit bakes along with the cake it resembles a buckled look. You could also say this is very similar to a coffee cake. Whipped Cream | Add a dollop of whipped cream right on top of the cake. Dust with a little cinnamon for color and added flavor and dive right in. Ice Cream | Go all out and serve it a la mode style. Scoop up some vanilla bean ice cream and serve warm. The perfect way to treat yourself for the day. Start by heating our oven up to 375°F. Then take your 8×8 pan and grease it. Whether you spray with a cooking spray or use butter, just make sure the pan is well-greased. Then start by whipping up your sugar and butter until it is light and fluffy. This takes around 2-3 minutes on medium speed. Slowly add in one egg at a time followed by vanilla. Then grab a small bowl and combine all your dry ingredients and mix. Then pour the dry ingredients into your batter. Once it is well blended, grab a spoon and stir in your blueberries. Pour into your pan and then make and sprinkle the streusel topping on top. Bake for 30-35 minutes or until your toothpick comes out clean. I do, I find that it stores nicely in the fridge and will keep longer than letting it sit on the counter. If you don’t like the cake served cold just heat it up for a few seconds in the microwave. Yes! Just allow your Blueberry Buckle Cake to cool completely, and then wrap in aluminum foil and place in a sealable freezer bag or container. Then just remove and allow to come to room temperature or thaw in fridge before serving. I hope you all enjoy this Blueberry Buckle recipe as much as my family does. You will be amazed at how easy it is to make. A single layer of blueberry cake with a sweet streusel topping. Serve with a scoop of vanilla ice cream! Preheat oven to 375°F. Grease an 8 inch baking pan and set aside. Beat sugar and butter together with an electric mixer on medium until blended. Beat in eggs and vanilla. In another bowl, combine flour, baking powder, salt and cinnamon. Stir flour mixture and buttermilk into the sugar mixture until well blended. Stir in blueberries and spoon the batter into the baking pan. For the Streusel topping, combine all the ingredients except the butter. Add butter in and mix until it becomes crumb like. Sprinkle the streusel evenly over the batter. Bake 30 to 35 minutes or until a toothpick comes clean from the centre of the cake. I made this last week and it was delicious but wasn’t enough. Can I double the recipe by doubling all the ingredients? 4 tsp. of baking powder seems like a lot. Thanks. 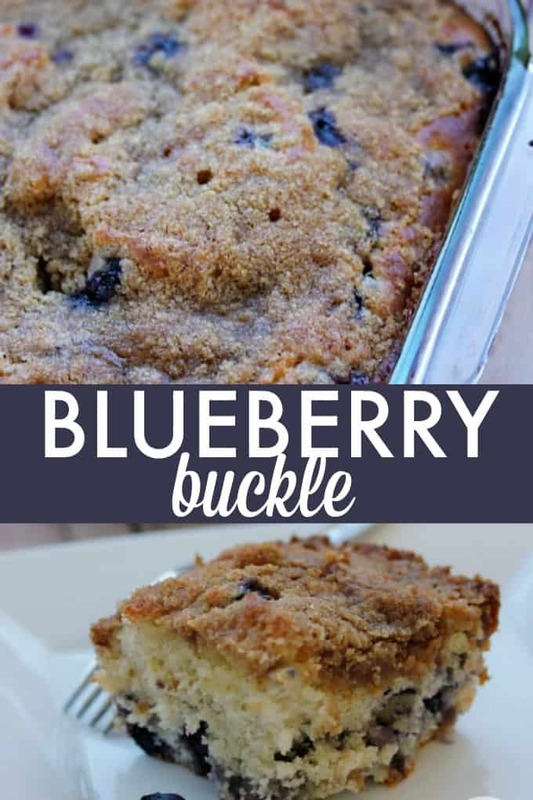 Oh, I love blueberry buckle! Pinning this right now. Yum! This recipe looks great! Sounds perfect for a cold winter morning. Just made this. I think my butter might have been too soft and I do have some deep buckles. lol. Doesn’t matter though, because the taste is divine! Thank you for sharing. Can I make this the night before, refrigerate, and reheat the next day before serving?